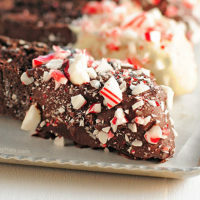 Chocolate Peppermint Biscotti are sweet and crunchy and the perfect compliment to a cup of warm coffee or hot chocolate. Make your own right at home to enjoy and share with friends. The crunch of biscotti has always been satisfying. The taste? Kinda underwhelming. Not really worth the calories. That is until now. 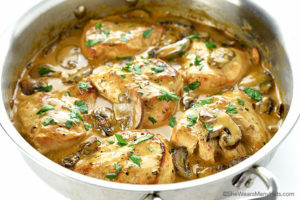 I recently discovered a recipe at Epicurious.com that was originally published in Gourmet magazine back in 1994. It was for a biscotti that claimed to have a deep chocolatey flavor, unlike many biscotti that you find sometimes in stores. So I gave it a try. And I’m so very glad I did. Yes, they do have a fabulous rich chocolatey flavor and are totally calorie worthy in my book. 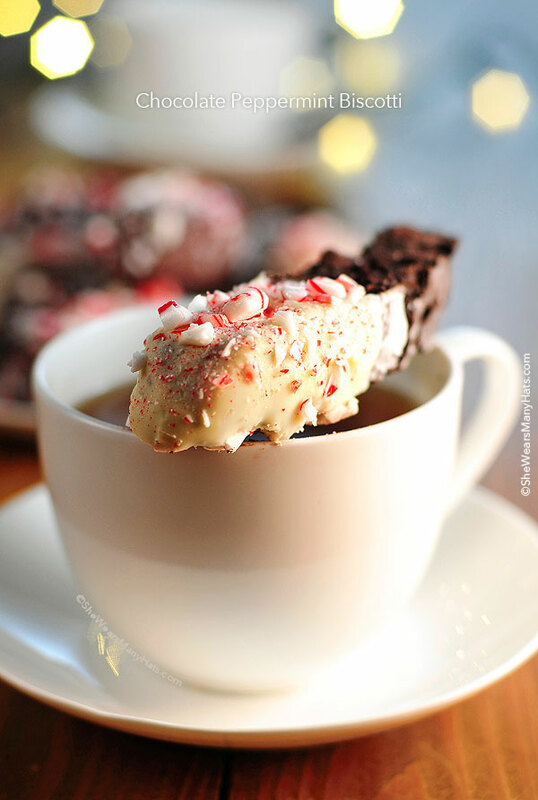 I adapted the recipe slightly to create a Chocolate Peppermint Biscotti version, which makes for the oh, so perfect companion for coffee or hot chocolate. The recipe is straight forward, and if you haven’t made biscotti before, don’t be intimidated. It’s basically like making cookies. Not difficult at all. Just an extra toasting step at the end. For more chocolatey minty goodness, dip in dark chocolate or white chocolate and sprinkle with finely crushed peppermint. Yum! 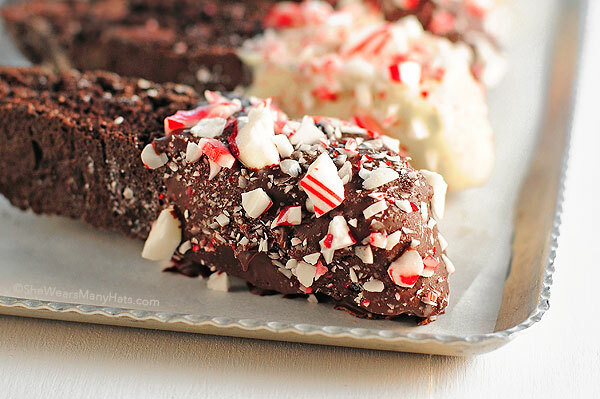 These Chocolate Peppermint Biscotti definitely have a deep chocolatey flavor without being overly sweet. Hints of salt peek through along with just the right amount of peppermint for a lovely holiday treat. These are sneaky addicting. You have be warned. Sneaky, I say! Also, if you are on the hunt for an edible gift to bake for friends, these chocolatey biscotti make a terrific gift to package up, along with a coffee mug and coffee. I know I would love to receive some homemade biscotti any time of the year! A rich chocolatey biscotti with hints of salt and the perfect amount on peppermint flavor. Preheat oven to 350-degrees F. Prepare large baking sheet by lining with parchment, baking mat, or with butter and flour. In a bowl whisk together flour, cocoa powder, baking soda, and salt. In a separate bowl, using an electric mixer beat together butter and granulated sugar until light and fluffy. Add eggs and beat until combined well. Add peppermint extract and combine well. Stir in flour mixture to form a stiff dough. Mix in chocolate chips until combined. Divide dough in half. Flour hands and form dough into two slightly flattened logs on prepared baking sheets, each approximately 12 inches long and 2 inches wide. Sprinkle with confectioners' sugar. Bake 30-35 minutes, or until slightly firm to the touch. Cool on baking sheet 5 minutes. Transfer to cutting board and cut diagonally into 3/4-inch slices. Arrange biscotti, cut sides down, on baking sheet and bake again for about 10 minutes, or until crisp. Cool on a rack. 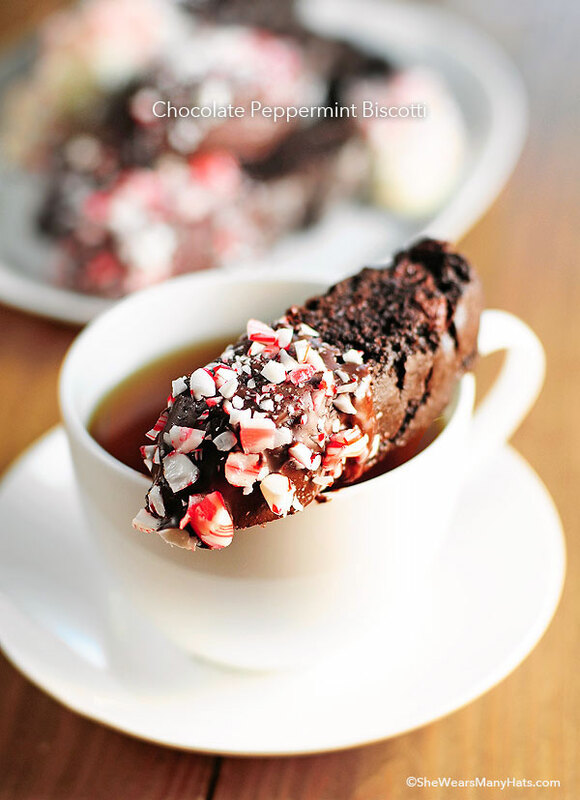 Optional: Once cool, dip one end in melted chocolate and sprinkle with finely crushed peppermint. Let firm up on cooling rack. Store in airtight containers up to 1 week. If not dipping in chocolate, biscotti may be kept wrapped in freezer safe plastic wrap and frozen up to a month. Originally published December 17, 2013. 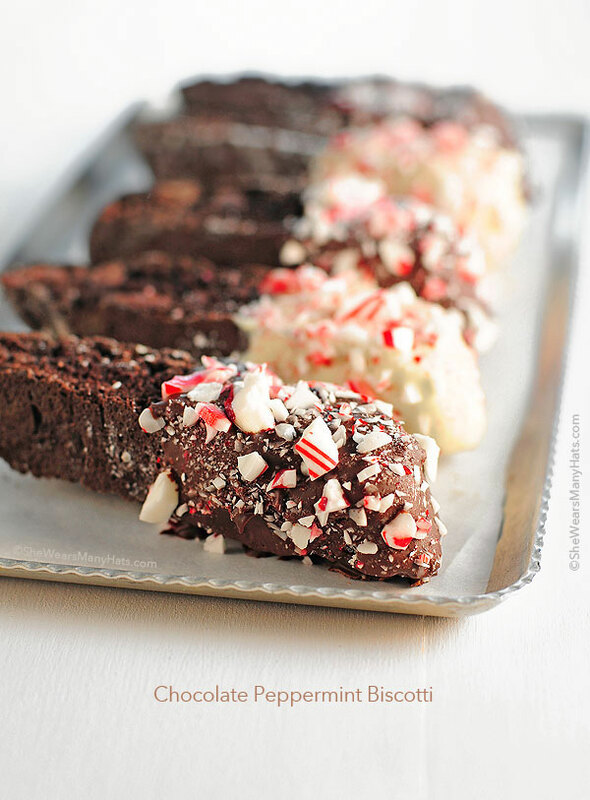 The photo is really mouthwatering, even though I don’t like either peppermint, or biscotti. I think biscotti is too hard, and it makes me feel like I am biting into a brick. May be I just never had the good biscotti to appreciate it. I love biscotti and this flavour looks perfect! Yum! Mmm! This is so pretty! Wising I had some now to finish off the night with! 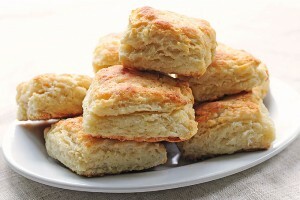 wow…those cute looking biscotties are just poppting out my laptop screen!! loved your pro. looking clicks dear!! I love the deep chocolatey flavor. Am amazing breakfast treat with coffee. It is so perfect for coffee, so much so that I’m a biscotti fan now! Enjoy! Amy, I made these biscotti twice and LOVE them. For the non Holiday season I mix the peppermint pieces into the batter to get that extra crunch and flavor. Please tell me how you get the pretty glaze on top of the biscotti. I sprinkle the confectioners sugar but it stays on top without giving the shine. So happy to hear that, Petra. As far as the glaze, I’m not adding or doing anything extra. After the first baking my biscotti kind of separated down the middle.. Any idea what I did? Marie, do you mean it cracked? This is my FAVORITE biscotti recipe. I make it at Christmas, especially, to give as gifts. A friend who isn’t typically a baker even asked for the recipe to make it herself! I enjoy it too, Anne!